Chapman Gallery is located at 46 East State St. Doylestown PA. Hours are Tues, Wed, Thurs 10-5. Fri and Sat 10-7 and Sunday 12-5. Founded in 1989, the Chapman Gallery specializes in original work and fine prints by living Bucks County area artists. The Chapman Gallery shows a predominance in oil painting but also exhibits watercolor, acrylic, pastel and fine prints. Over the past twenty years the Chapman Gallery has established a reputation for exhibiting the highest quality art from award-winning and established local artists. 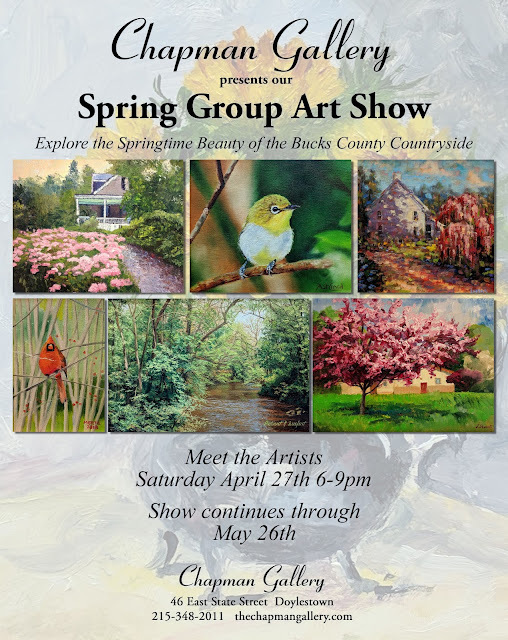 The gallery retains a powerful identity in Bucks County and easily recognizable style that has earned an exceptionally loyal following. We offer custom picture framing which is done on location in our framing facility on East State Street Doylestown, Bucks County, Pennsylvania. We restore and conserve watercolors, oil paintings and antique picture frames. The Gallery provides appraisal, design and consulting services for private individuals as well as large companies. The fine art gallery staff are happy to help with any inquiries from painting purchases to frame layout. Located on East State Street, our Fine Art Gallery and Custom Frame Shop is centrally located in downtown Doylestown, Bucks County, Pennsylvania.